February 17, 1936 James Nathaniel “Jim” Brown, hall of fame football player and actor, was born in St. Simons Island, Georgia. Brown earned his Bachelor of Arts degree from Syracuse University in 1957 and also excelled in basketball, track, lacrosse, and football. In his senior year, he was first-team All-American in both football and lacrosse. 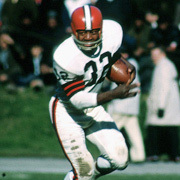 Brown was selected in the 1957 NFL draft by the Cleveland Browns and over his nine season professional career was a nine-time Pro Bowl selection and three-time NFL Most Valuable Player. When he retired in 1965, he held many professional football records, including most career rushing yards and most career rushing touchdowns. Brown was inducted into the Professional Football Hall of Fame in 1971, the National Lacrosse Hall of Fame in 1983, and the College Football Hall of Fame in 1995. In 2002, The Sporting News named Brown “the greatest football player ever.” Brown began his acting career prior to retiring from football, appearing in “Rio Conchos” in 1964. Other films that he appeared in include “The Dirty Dozen” (1967), “100 Rifles” (1969), “Three the Hard Way” (1974), and “On the Edge” (2002). Brown has published two autobiographies “Off My Chest” (1964) and “Out of Bounds” (1989). In 2002, the documentary film “Jim Brown: All-American” was released. Brown currently serves as executive advisor to the Cleveland Browns. He is also active in forming groups to assist black-owned businesses and to rehabilitate gang members.